Profit is the value remaining after a company’s expensesExpensesAn expense is a type of expenditure that flows through the income statement and is deducted from revenue to arrive at net income. Expenses are considered have been paid and can be found on an income statementIncome StatementThe Income Statement (or Statement of Profit and Loss) shows performance from operations of a business. The financial statement begins with revenues and. If the value that remains after expenses have been deducted from revenue is positive, the company is said to have a profit, and If the value that remains is negative, it is said to have a loss (see: P&L statementProfit and Loss Statement (P&L)A profit and loss statement (P&L) is a financial report that provides a summary of a company's revenues, expenses, and profits/losses over a period of time). Other terms for profit that mean the same things are earnings and income. Gross profit is the value that remains after the cost of sales, or cost of goods sold (COGS)Cost of Goods Sold (COGS)Cost of Goods Sold (COGS) measures the “direct cost” incurred in the production of any goods or services. It includes material cost, direct labor cost, and direct factory overheads, and is directly proportional to revenue. As revenue increases, more resources are required to produce the goods or service. COGS is often, has been deducted from sales revenue. This is typically the first sub-total on the income statement for most businesses. Operating profit, also called Earnings Before Interest and Taxes (EBIT)EBIT GuideEBIT stands for Earnings Before Interest and Taxes and is one of the last subtotals in the income statement before net income. EBIT is also sometimes referred to as operating income and is called this because it's found by deducting all operating expenses (production and non-production costs) from sales revenue., is the value that remains after all operating expenses have been deducted from revenue. This is typically the second sub-total on the income statement. Examples of operating expenses include sales, marketing, advertising, salaries and wages, employee benefits, depreciation, rent, commissions and any other costs that relate to the ongoing operations of the business. Net profit (also called net incomeNet IncomeNet Income is a key line item, not only in the income statement, but in all three core financial statements. While it is arrived at through the income statement, the net profit is also used in both the balance sheet and the cash flow statement. or net earnings) is the value that remains after all expenses, including interest and taxes, have been deducted from revenue. This is the final figure located at the bottom of the income statement. The net earnings figure includes non-operating expenses such as interest and taxes. It can also be referred to as net income or net earnings. Below is a screenshot of Amazon’s 2017 statement of operation (income statement) from CFI’s Advanced Financial Modeling Course. 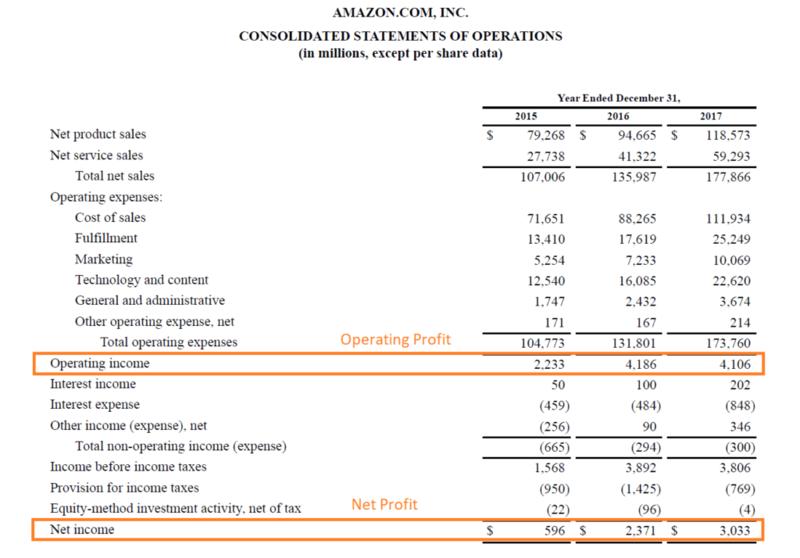 As you can see, Amazon doesn’t have a gross income subtotal, but it does have an operating income and a net income. For 2017, by taking net sales of $117.9 billion and subtracting operating expenses of $173.8 billion, you will arrive at the operating income of $4.1 billion. Then, to get to the bottom line, subtract from the amount the interest, taxes and any other income/expenses to arrive at the net income of $3.0 billion. As mentioned previously, it is not a requirement to have a gross profit subtotal, as is the case with Amazon. Cash flow and profit are both important metrics when evaluating a company’s performance, and each has its pros and cons. Cash flow measures the actual value of cash generated or consumed by a company, while income is an accounting figure that uses the accrual principleAccrual PrincipleThe accrual principle is an accounting concept that requires transactions to be recorded in the time period during which they occur, regardless of the time period when the actual cash flows from the transaction are received. The idea behind the accrual principle is that financial events involve matching revenues. To learn more, check out CFI’s various financial analysis courses.